Applying for a job entitles every aspirant to a selection process. 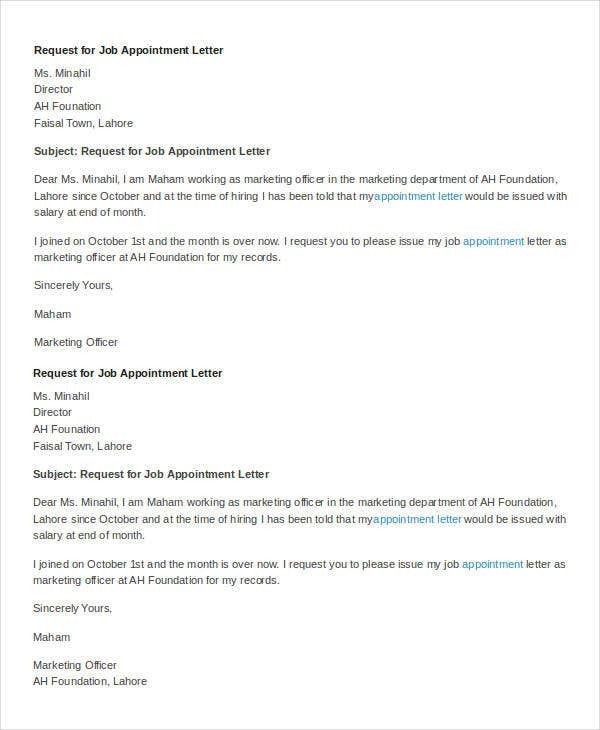 After the candidates are finally selected for the job, the employer will then send an appointment letter to those who have successfully completed the selection process. 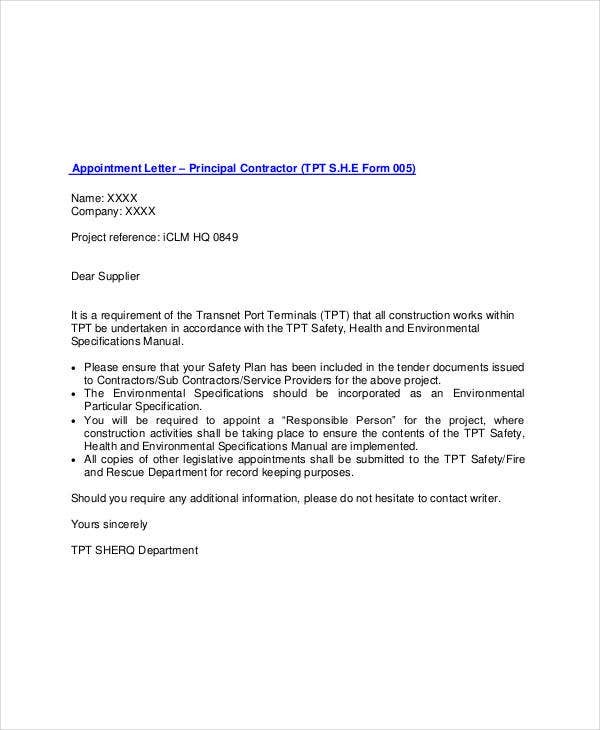 The appointment letter is used to inform and invite the selected candidate to take on the specified position and states the conditions of the job and its duties and responsibilities. 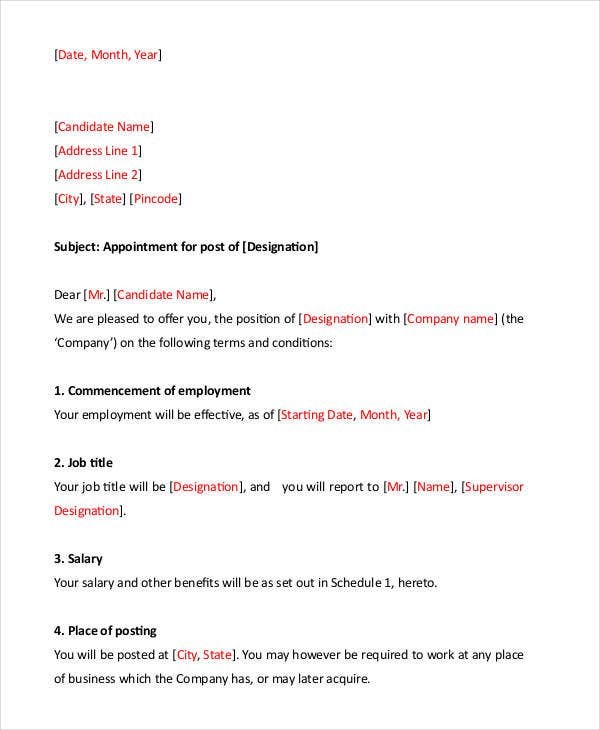 The candidate will then examine the terms and conditions fully disclosed by the employer on the appointment letter and sign it if these are acceptable to him. 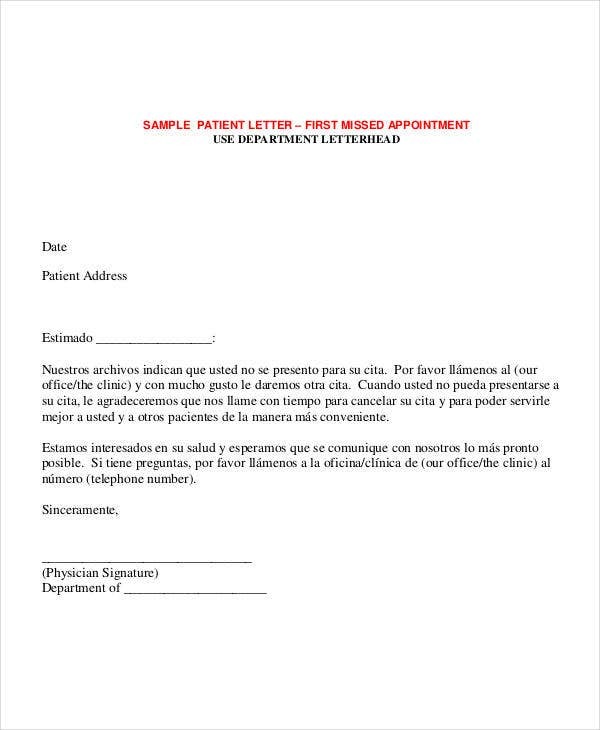 On this page, we have gathered some Free Appointment Letter Templates, for any employer or anyone in need of these to download and use. They can also be used as a reference to create a unique but professional one for your business or organization. These templates are free to download so you can change the details and edit them according to your preferences and needs. What are you waiting for? Feel free to browse through these templates as we made sure we have all that you need. 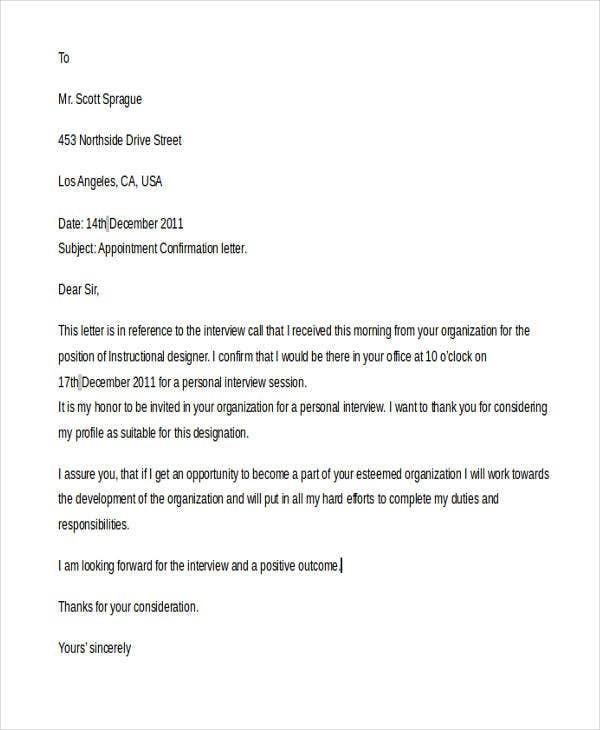 An appointment letter is defined as a document which usually serves as the culmination of all the discussions and negotiations made during the job interview of the employment process. It can also be used as a legally binding document which confirms that a company or an organization has offered a position to an individual and that individual have considered and agreed to accept the terms and conditions pending the compensation details. It also indicates the duties and responsibilities expected from the new employee and he role he or she will play in the company. 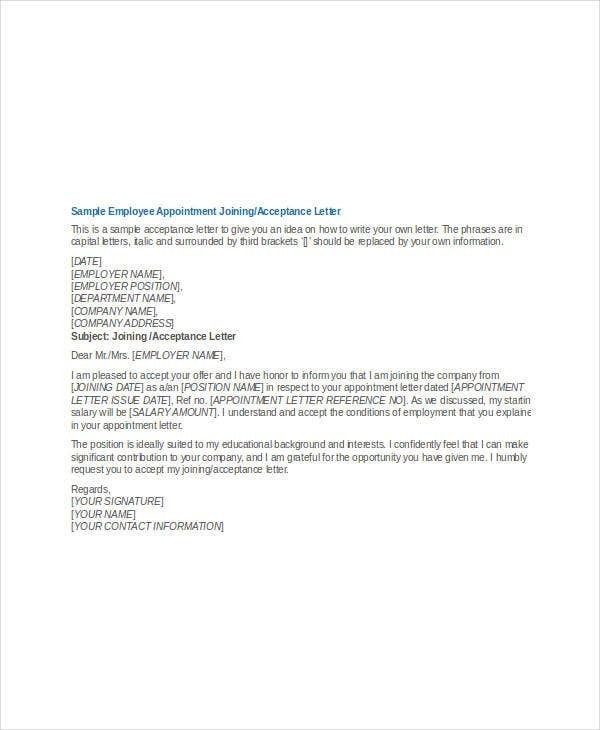 By reviewing the templates on this page, an appointment letter has different variations based on the kind of job you’re offering. 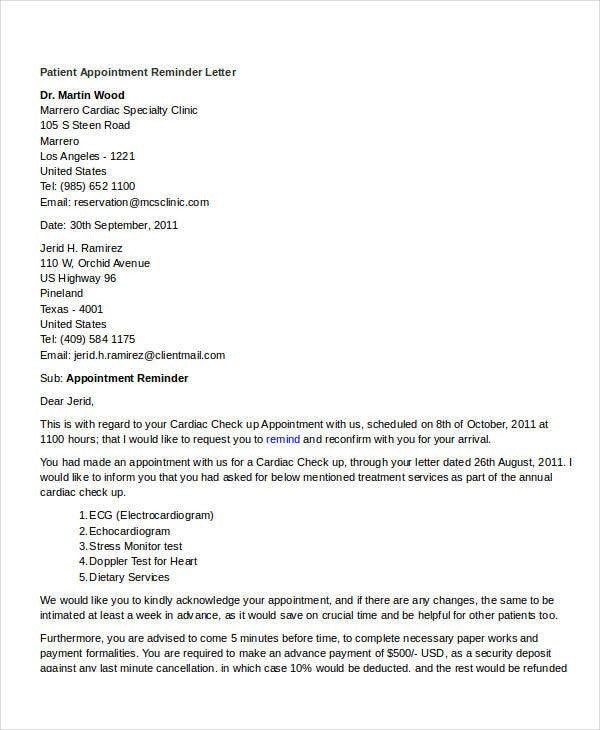 However, there are some standard contents that should be included in every appointment letter and they are listed below. Employer details. 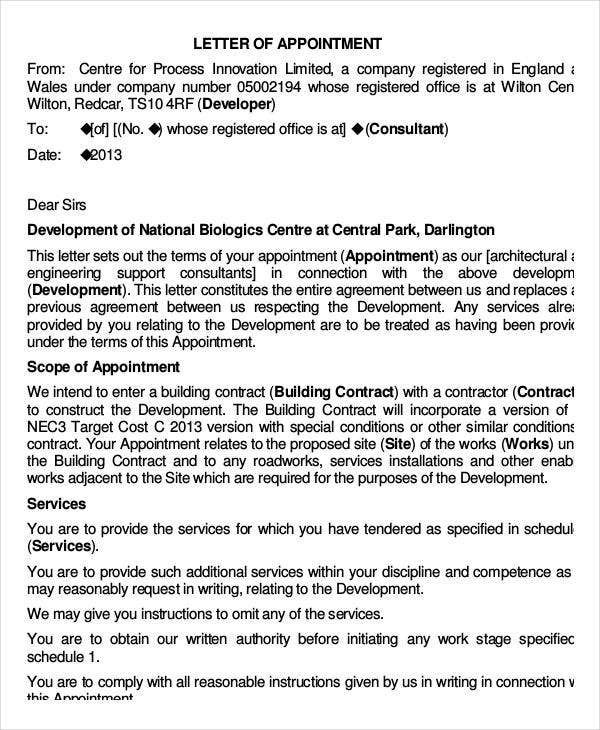 This is the first part of the letter which shows the employer or business’s name and the address of the organization. Applicant details. After the employer details are the applicant details which consists of the name and address of the applicant. Position. 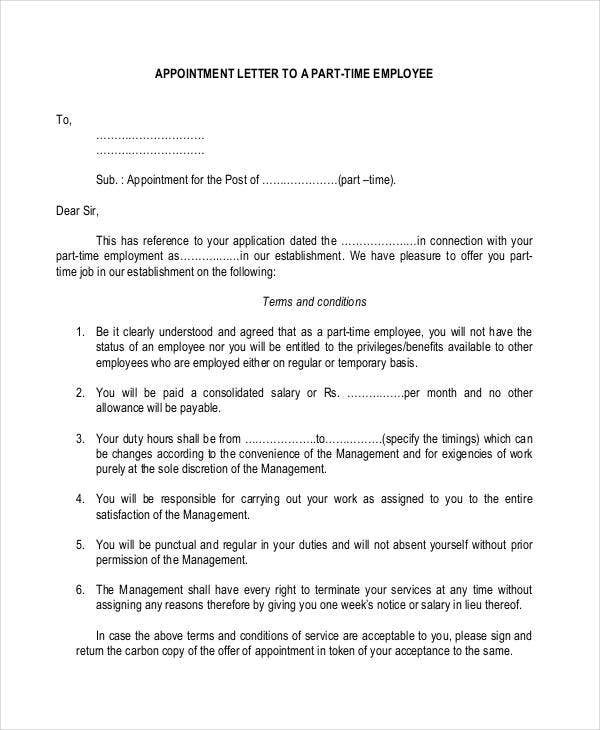 An appointment letter is a guarantee of the specific job and position offered by the company; therefore, it should be carefully stated. Job description. 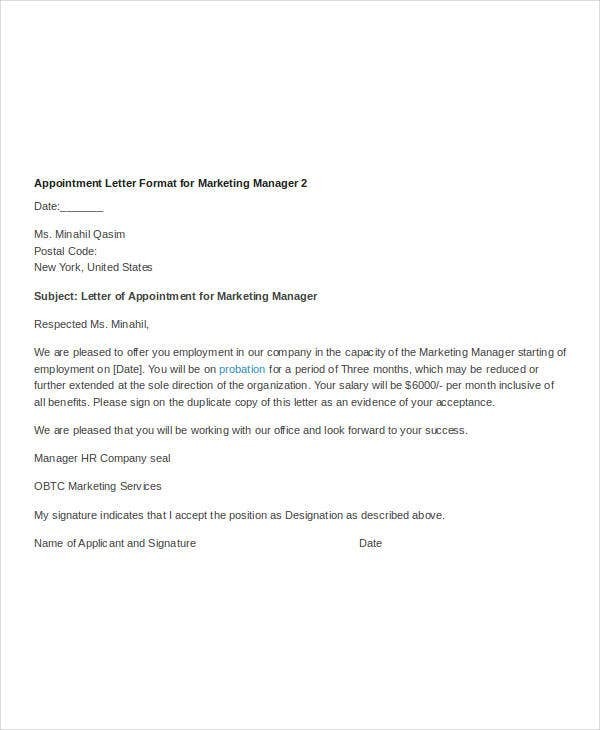 Together with the name of the position, the description of the job, such as the duties and responsibilities, are stated in the appointment letter. Salary packages. This includes the monthly salary as well as how the salary is computed, whether it is hourly or per output. It also includes when the salary is given. Contract length. The appointment letter should also include the date of joining and the length of contract if the position is contractual. Documents required. 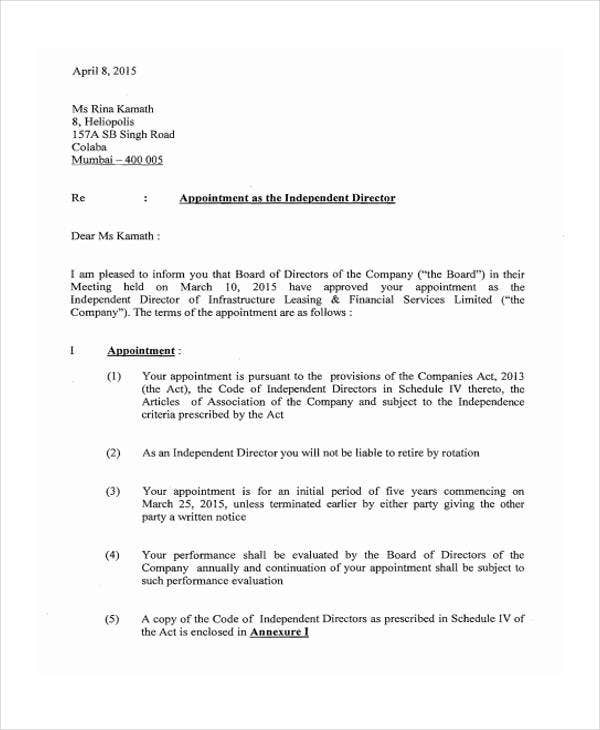 It should also include the documents that are needed upon joining the company. It could include security or benefits requirements. 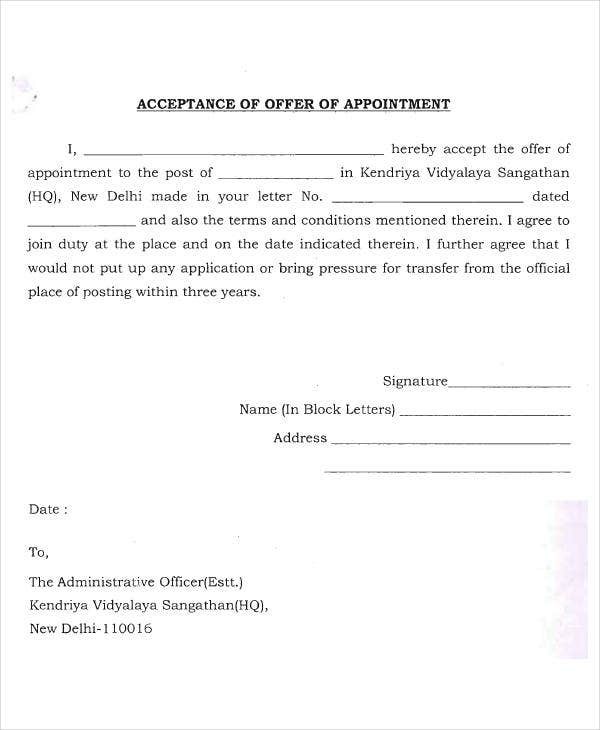 These contents can also be found in Offer Letters, but they differ because they are given before the appointment letter. 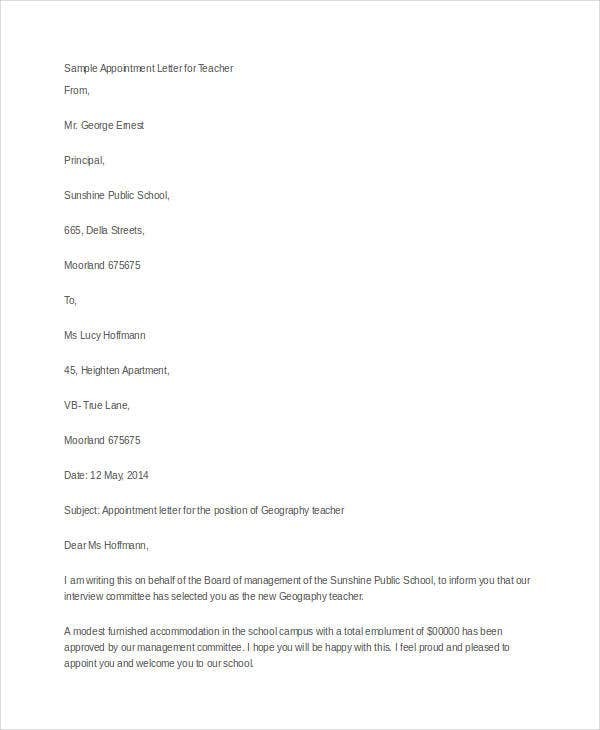 They are used to introduce the position and its description which the candidate examines and decides whether to accept the position or not; only then is the appointment letter given. 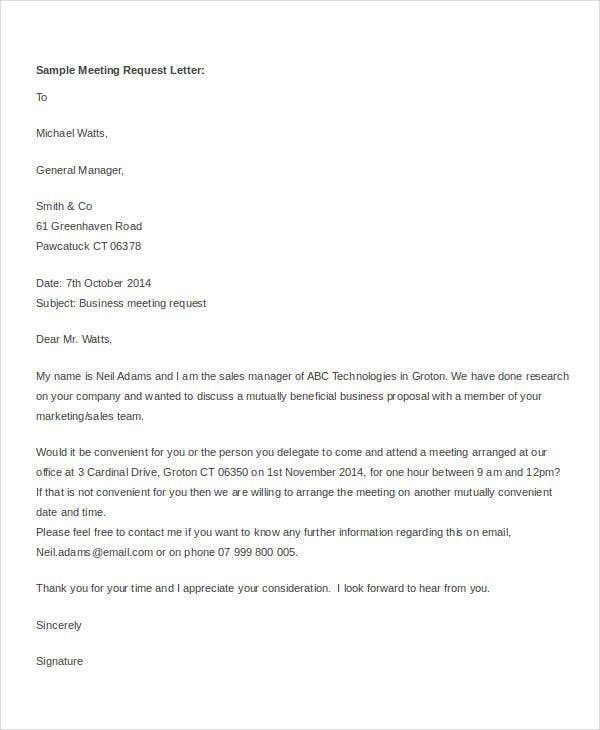 Just like any other letters, such as Application Letters, an appointment letter follows a standard format, although the contents can vary differently depending on the type of job being or the industry the company belongs. 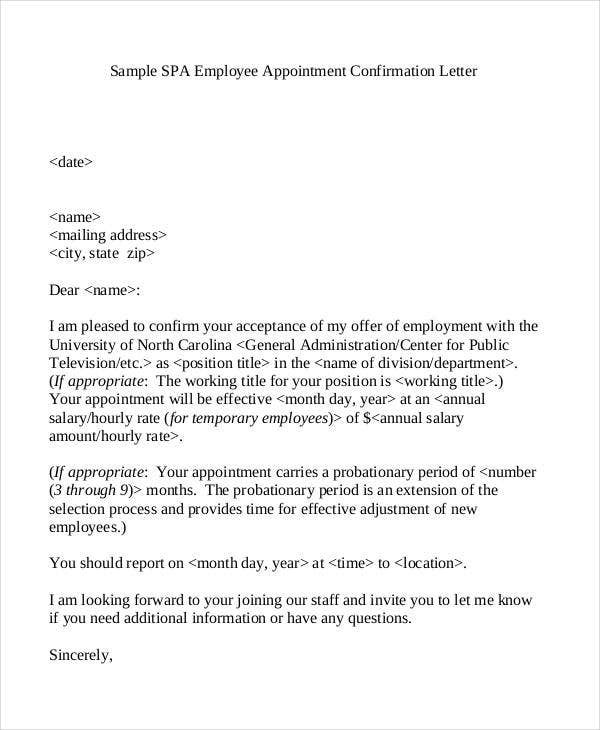 Below is a discussion of the different parts of an appointment letter. Date of correspondence. It is important to indicate the date in which the letter is written, especially if you need a response in a specific period of time. It provides the potential employee enough time to decide. Details of the employer. This includes the name and address of the employer to indicate where the letter comes from. It also includes a contact information so that the potential employee can easily reach them. Subject of the letter. The subject part indicates what the letter is all about and provides an idea about the contents and what to expect from the letter to the reader. Greeting. The greeting indicates the person which are the letter is intended to. If you know the individual well, you can use their first name to make your letter personal instead of too businesslike. The body of the letter. The body of the letter contains the essential details of the employment process such as the job description and conditions, so they should be presented in a concise, accurate and logical manner. Salutation. The salutation or closing should indicate the person responsible for hiring or firing the employees. It could be the employer or CEO of the company, or the HR manager if there is any. Job Appointment for New Employees. 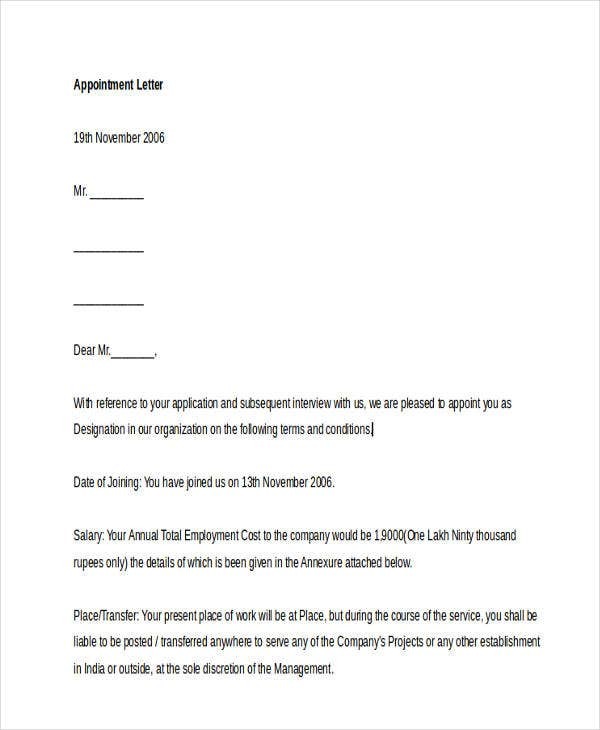 This is the most common type of appointment letter which is given to potential employees inviting them to take on a certain position in the company. 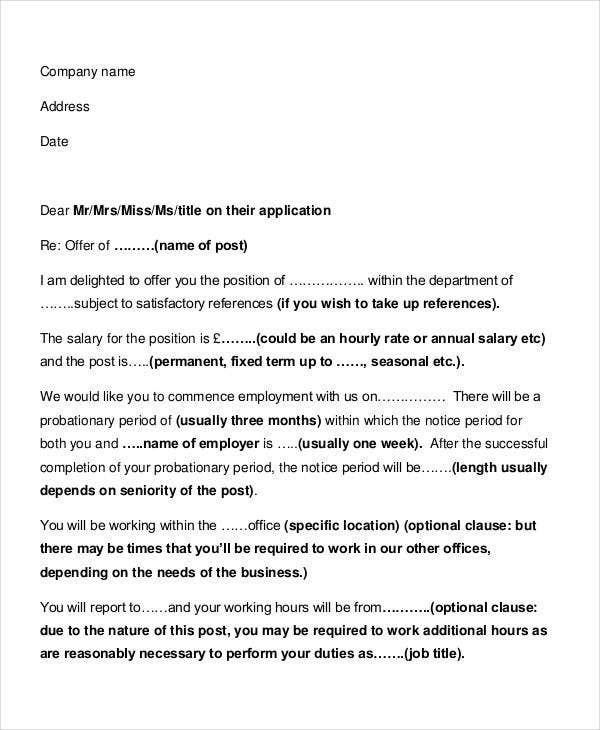 This letter includes the terms and conditions of the job being offered. 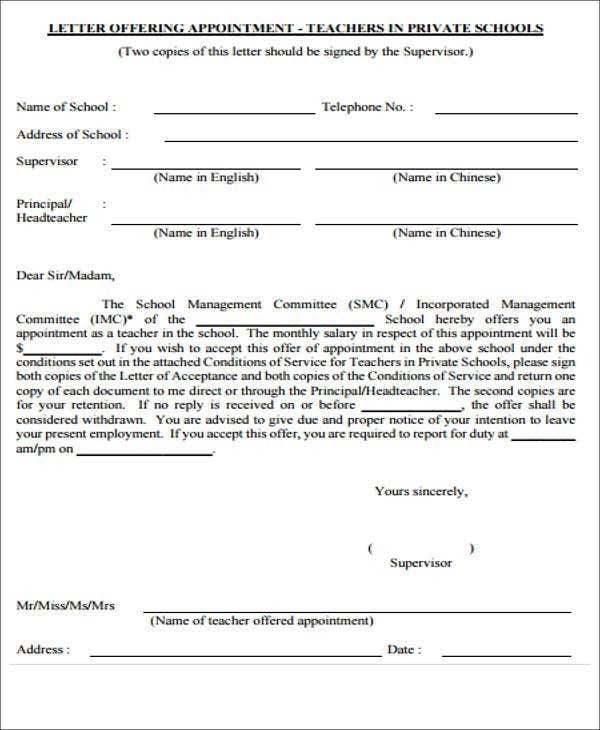 Appointment Letters for Employees. 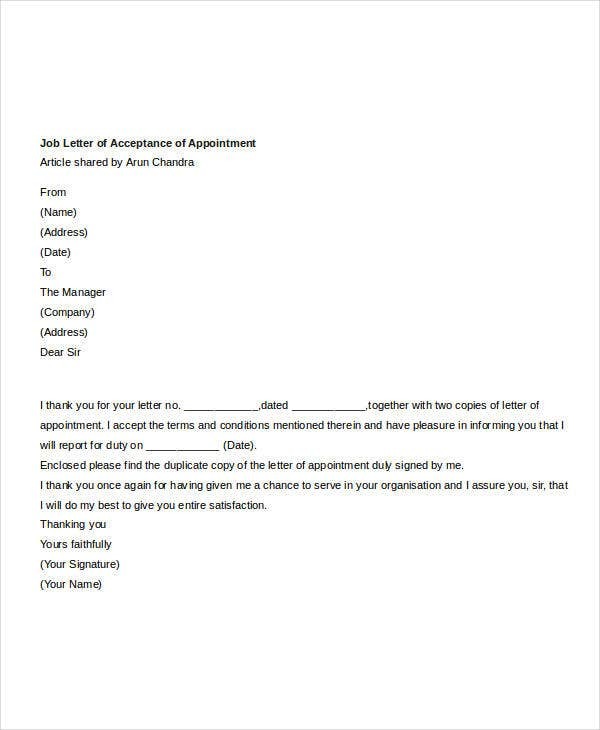 Unlike the Job Appointment Letter Templates, the appointment letters for employees on this page are for employees that are given new or higher positions, also called promotions, within the company. 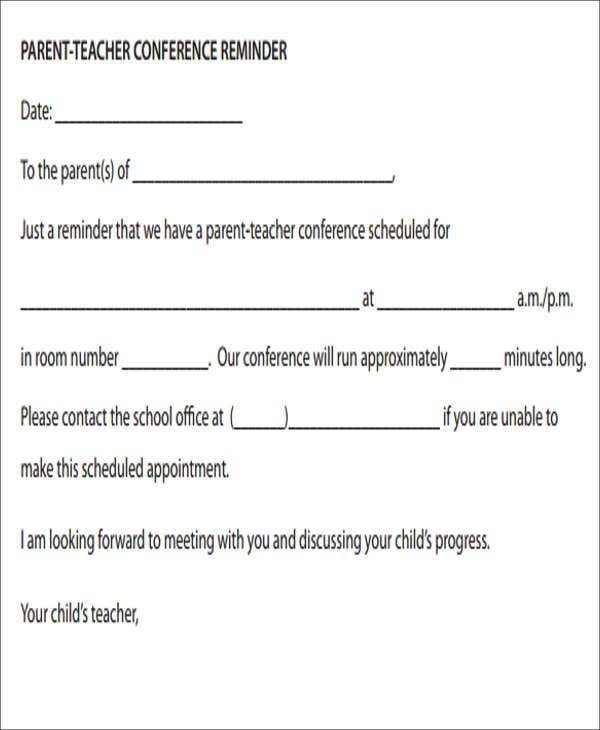 Appointment Letters for Teachers. 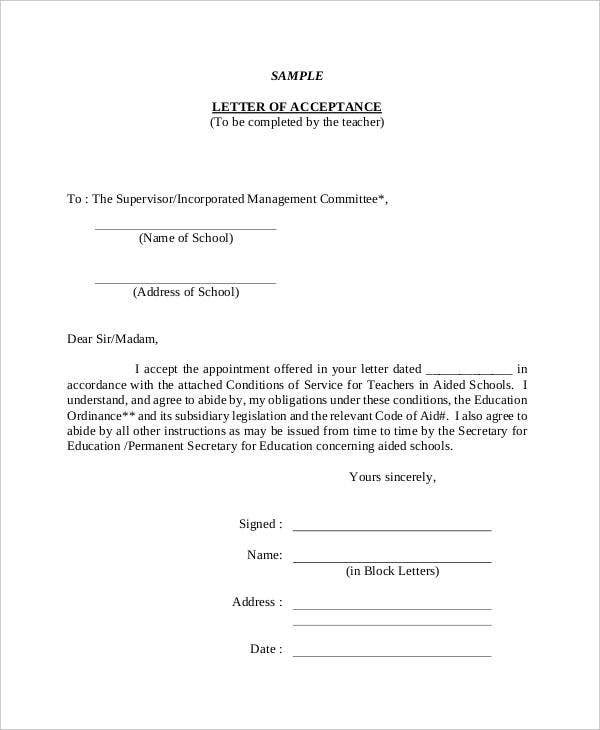 The Appointment Letters for Teachers on this page are different from the common ones for employees as they indicate the subject and grade level they must teach. This could also be used to present a promotion for teachers. 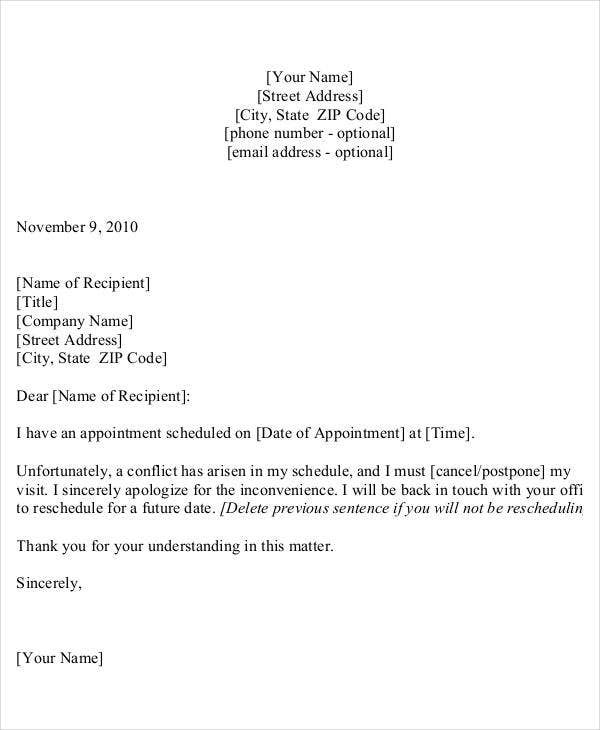 Request for Appointment Letters. 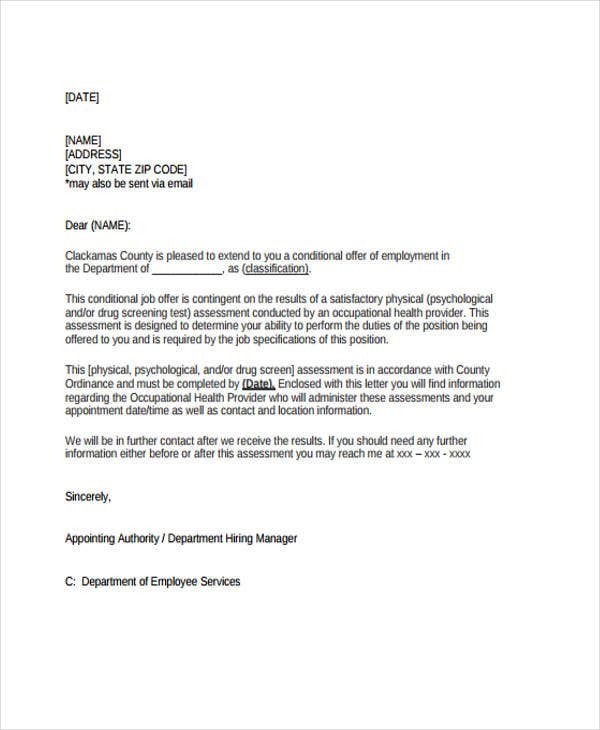 The type of letter asking for a job appointment is given by employees to their employers to request a change in position in the company. It could also be used to request a meeting with a business partner or a health personnel. 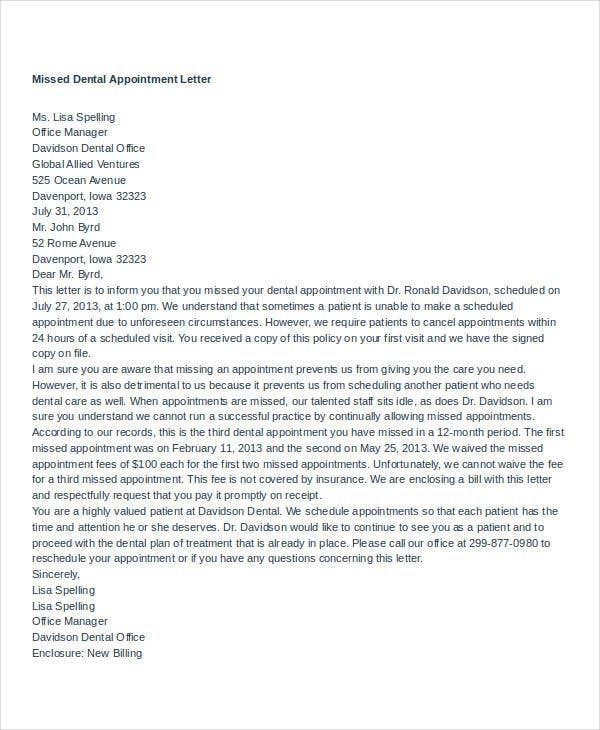 Missed Appointment Letters. 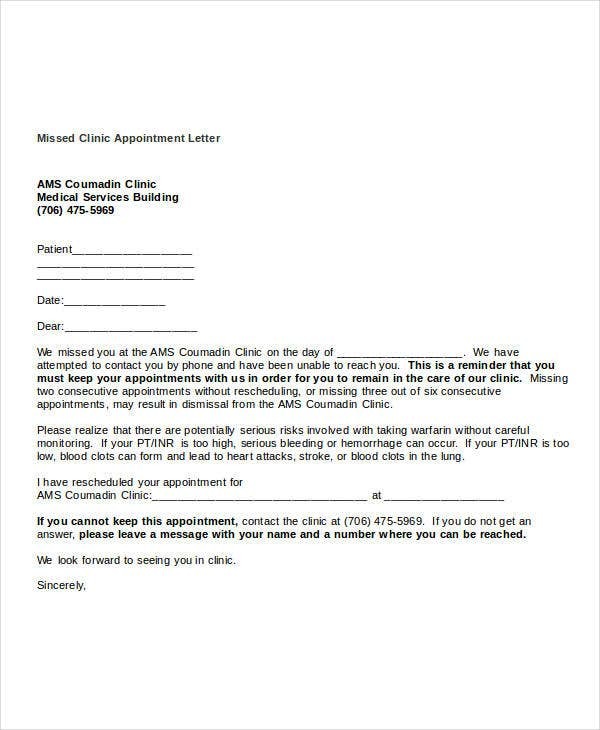 This type of letters is usually given to health personnel in cases where patients missed their appointed schedules for consultation. They contain an apology as well as the reasons for missing the appointment schedule. 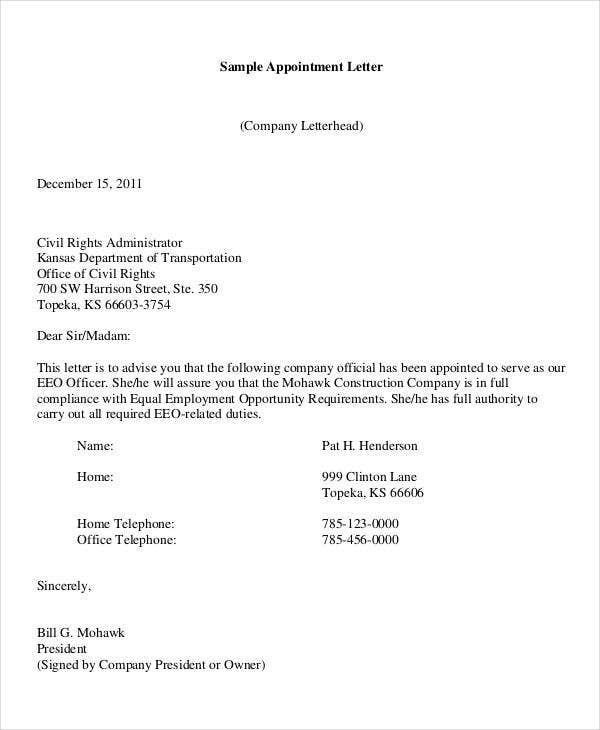 Appointment Confirmation Letters. 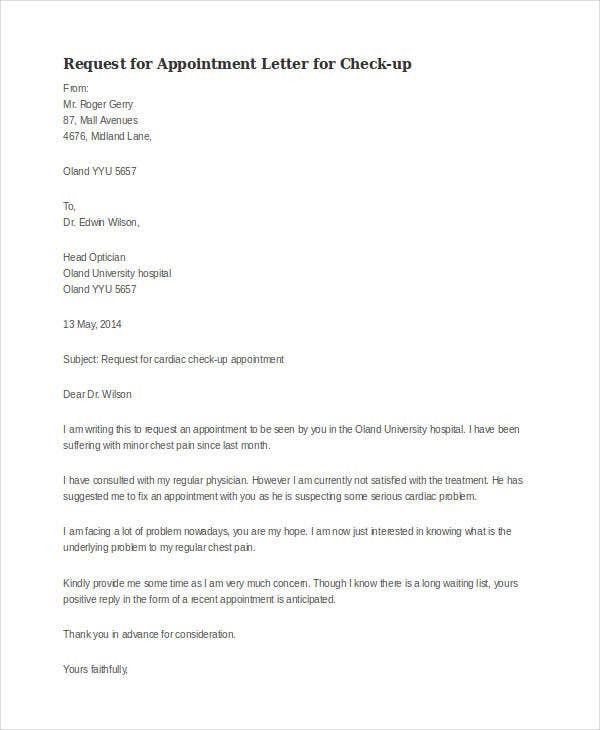 These are written as a response to the request for an appointment confirming its acceptance. 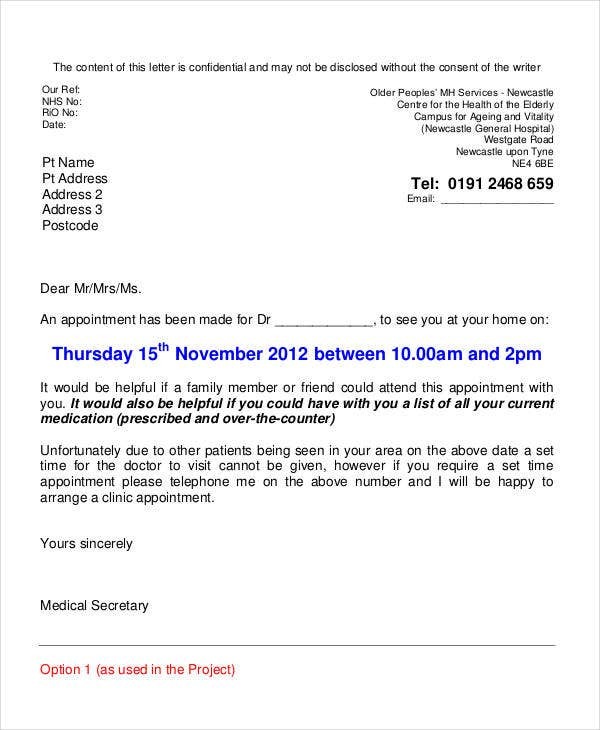 Appointment Reminder Letters can also be given before of after confirmation. 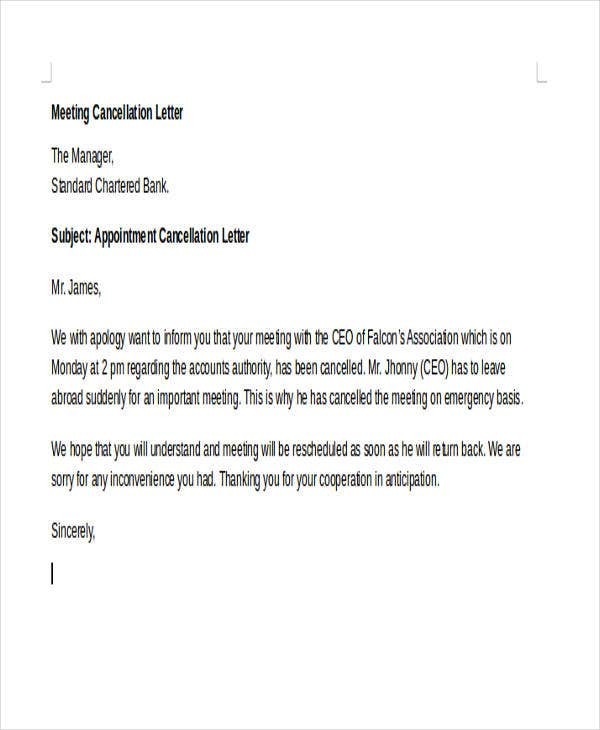 Another type of response is the Appointment Cancellation Letter. Appointment Acceptance Letters. 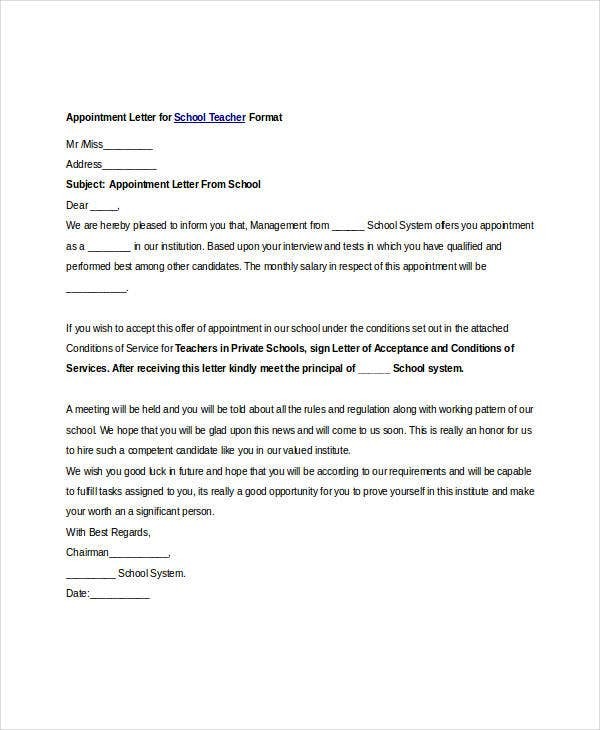 The Appointment Acceptance Letters you can see on this page can be used as a response to other appointment letters, such as the job appointment for employees and teachers. 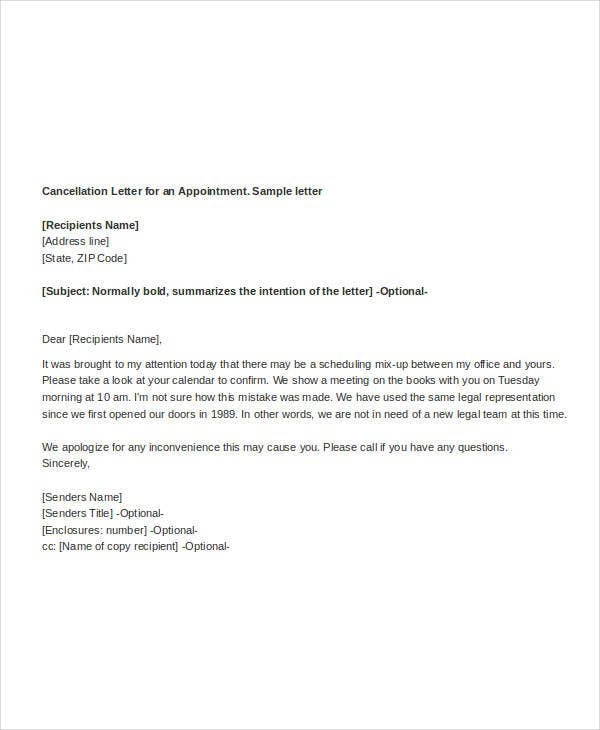 For more appointment letter ideas, take a look at other compilations of Appointment Letters in Doc. Open with a positive message. Start off with a congratulatory remark for being selected for the position and a warm welcome to the company, In this way, the person will feel that he or she is bound to be accepted as the new member of the organization. State important start details. Aside from the other information stated above, make sure to provide the start details, such as the start date and time, as well as the length of probationary period if there is any. Also, include the rate of pay and reporting relationships. At-will employment. Although sometimes unnecessary a statement that the employment is “at-will” should be included which means that the employer has the right to fire the employee for any cause that the employer may deem unhelpful to the company. Repeat the details discussed in the interview process. Make sure to reiterate the details you have discussed with the candidate during the interview process. These details may include company requirements prior to employment like drug tests or background checks. Don’t include details of an employment contract. Avoid mentioning details such as the grounds for termination or resignation or details about compensation and benefits, although they can be discussed in a brief manner and also intellectual property components. End with a positive note. You should end your letter as positive as to how you opened it. 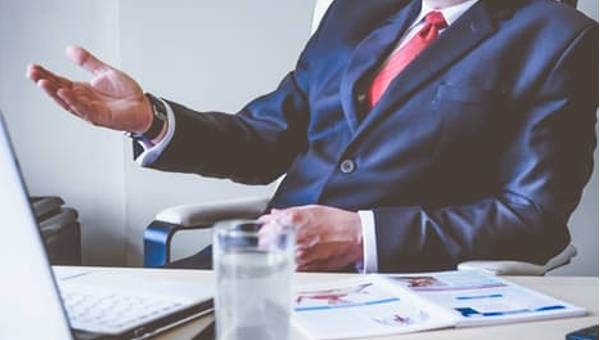 You can tell the candidate that you’re looking forward to a favorable response to the appointment letter and to him or her being a part of the company. Follow the guidelines. 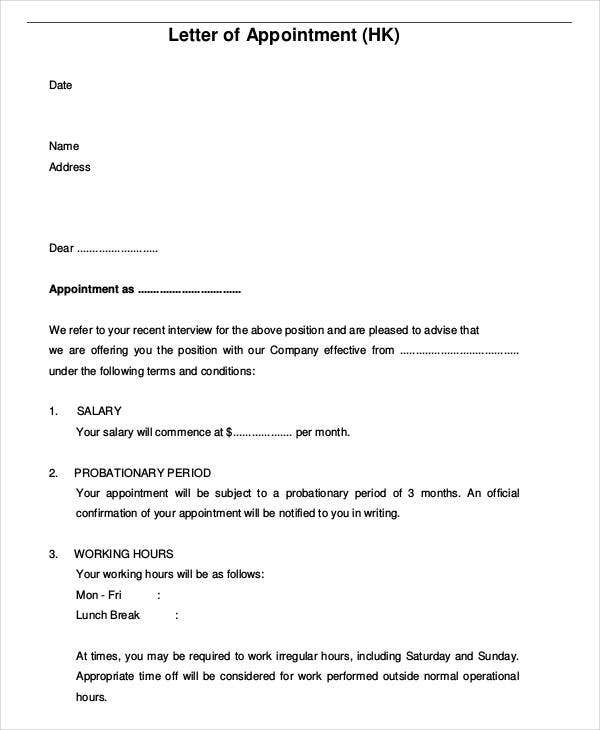 In order to prevent any discrepancies in the terms and conditions of employment stipulated in the appointment letter, you should follow the basic outline and format on how to write this type of letter. Write your paragraphs sufficiently. The paragraphs of your letter should be sufficient enough to include all the necessary information. The first one should contain the job description while the second should consist of the job terms and conditions. Details should be brief and concise. Although it is necessary for the letter to go into important details, not every single term should be included in it as they can be discussed in the contract or employee work manual. Send two copies. Two copies should be sent to the potential employee to affix his or her signature which indicates agreement before the appointment is finalized. One copy should be signed, dated, and returned; and the other should be kept by the employee. 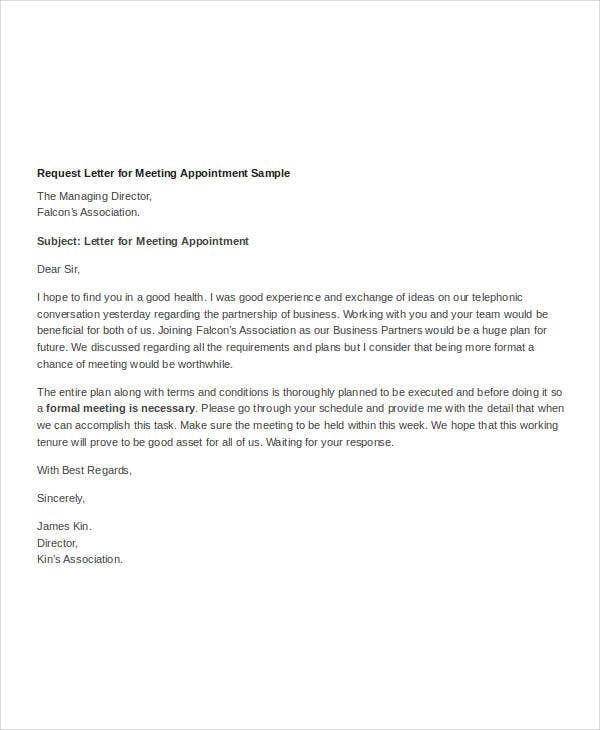 For other specific letter templates, you can check out our Trainee Appointment Letter Templates, too.